Despite your best weed-control efforts this year, you still ended up with patches or fields with weeds coming through the crop canopy. Now that August has rolled around, what options are available to control weeds and prevent them from going to seed? What can we do differently to prevent this problem next year? August is a good time to evaluate your current weed management plan and develop strategies for next year. Is there a herbicide available for rescue treatment? The short answer is no. Although it would be great to have a herbicide rescue treatment to control escaped waterhemp and other weed species that are now 3+ feet in height in soybean, there are no control options available. 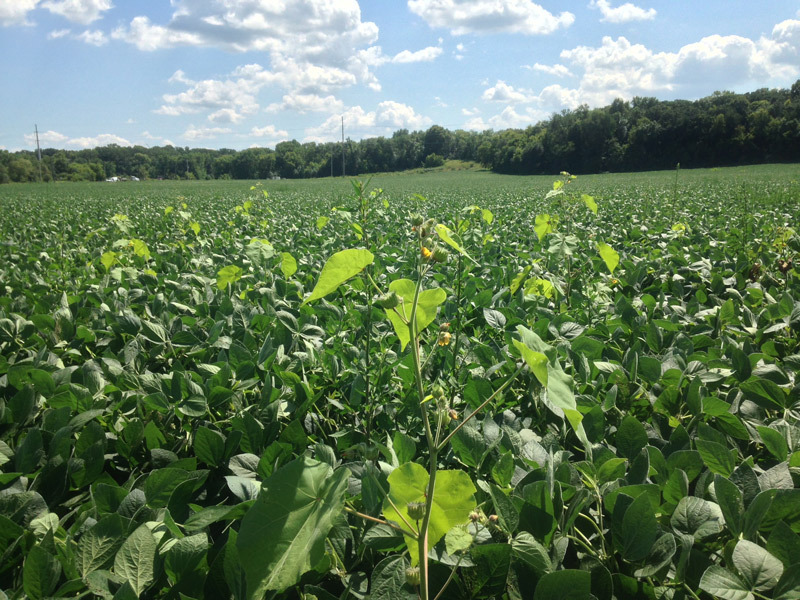 The crop stage at this point is generally advanced far enough that products, such as Roundup, Liberty, Flexstar, dicamba, and others are no longer labeled for use in soybean. Although some may be inclined to spray Cobra or other lactofen-containing products in an attempt to control weed escapes, they will not provide effective control of large weeds and have significant crop-injury potential (up to a 14% yield reduction) (Nelson et al. 2007). Lactofen-containing herbicides such as Cobra have a 45 day pre-harvest interval that also needs to be considered. Refer to product labels for pre-harvest intervals and other important information. In most instances, spot-spraying is the best herbicide option. Probably not. If weeds were controlled earlier in the season and there are few sporadic escapes, there will likely not be an effect on soybean yield. However, one weed can make weed control more difficult in the future if seed production occurs. Although seed production of weeds will vary widely, waterhemp can produce over 200,000 seeds per plant in competition with soybean, lambsquarters can produce over 70,000 seeds per plant, and giant ragweed can produce over 10,000 seeds per plant. How long will weed seeds stick around? If escaped weeds are allowed to produce seed, they have the potential to stick around for decades. Over 50% of lambsquarters seeds will still be in the soil seed bank in 12 years. For waterhemp, 50% of the viable seeds will be degraded in 3 years. Giant ragweed seeds are degraded relatively quickly, with over 95% of the weed seeds being degraded in 2 years according to recently published U of MN research (Goplen et al. 2017). No matter what escaped weeds you’re dealing with, preventing seed production should be the primary concern. Herbicides are not an option, but seed production can have lasting impacts on future weed control. Unfortunately the best option to control escaped weeds involves physical labor and pulling the weeds by hand. 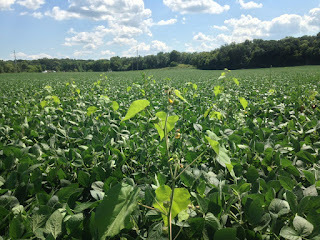 If soybean canopies are lagging behind and have not closed in, cultivation can still be used as an option, although cultivation will probably still not be effective on large weeds. 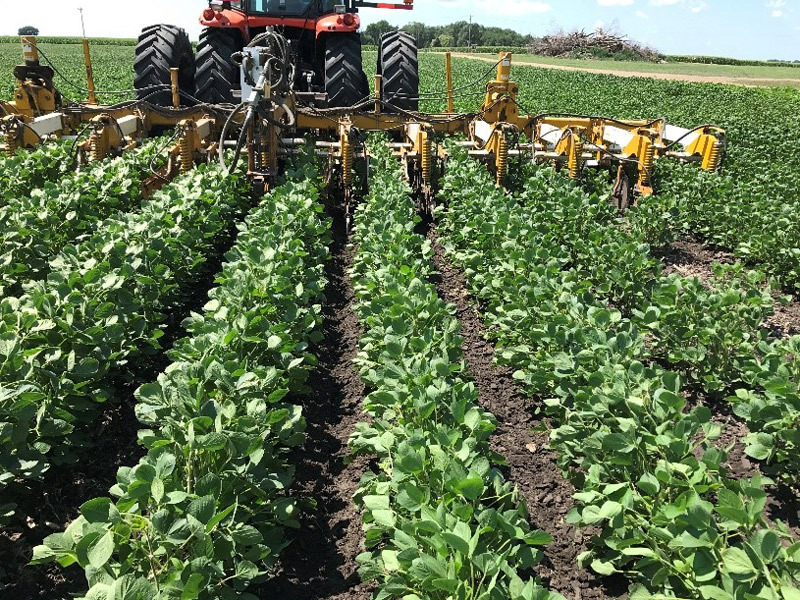 There have been sightings of bean bars and wick style herbicide applicators this year, which are also options that may be applicable to your scenario. Many soybean growers this year have incorporated “hand-pulling” of problem weeds in their fields in addition to other weed control methods. Some of these growers have questioned if mature weeds need to be carried out of the field due to concerns that these weeds may contribute to the weed seed bank within the field. Remember that many weed seeds need to be “ripe” or physiologically mature before they would be of concern for next year’s crop. If not yet mature, this is referred to as “innate dormancy,” which is defined as the process of growth of an embryo to a stage fit for germination which has not been completed while the the embryo was still borne on the parent plant. Most weeds in Minnesota will begin producing viable seeds in the next 1-2 weeks, so the time to pull or control weeds is now. If escaped weeds are not controlled prior to seed production, keep in mind that combines are one of the best ways to spread weed seed. If there is a confined patch of weeds, consider going around the weed patch to prevent spreading weed seeds throughout the field. Consider harvesting order too. To keep clean fields clean, combine weedy fields last to prevent spreading seeds from field to field. What can I do differently to prevent weed escapes next year? Be proactive! Review and reflect on your weed management plan. The time you invest in evaluating the plan is well worth it. What you do on your farm matters, so take control and take action. Which weeds survived and why? Be honest with yourself. How effective were your preemergence herbicides on your spectrum of weeds? Which weeds escaped control? Consider product choice, activation of herbicide (rainfall, soil types) rate used and length of residual control expected. How effective were your postemergence herbicides and on which weeds? Were applications timely, on small weeds, with appropriate coverage? Did you use multiple, effective sites of action on your weeds? Did they have residual activity? Did you include non-chemical tactics in your plan? Do you suspect herbicide resistance? One clue is you will often find surviving plants right next to dead plants of the same species. You may also see small patches of escapes in a field. If you have waterhemp that was not adequately controlled by PPO inhibitor herbicides (e.g. Flexstar, Cobra) or glyphosate, and you suspect herbicide resistance, consider submitting a leaf sample to the University of Illinois Plant Clinic for a molecular-based test for glyphosate and PPO inhibitor herbicide resistance. The University of Illinois Plant Clinic can also run a diagnostic test on plants you suspect to be Palmer Amaranth. In planning for next year this would be money well spent. Goplen, JJ, CC Sheaffer, RL Becker, JA Coulter, FR Breitenbach, LM Behnken, GA Johnson, and JL Gunsolus. 2017. 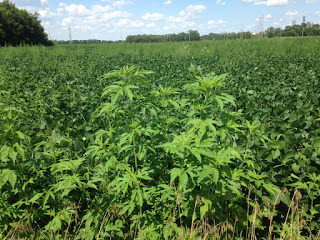 Seed bank depletion and emergence patterns of giant ragweed (Ambrosia trifida) in Minnesota cropping systems. Weed Sci. 65:52–60. Nelson, KA, GE Rottinghaus, and TE Nelson. 2007. Effect of lactofen application timing on yield and isoflavone concentration in soybean seed. Agron. Journal. 99:645–649.